Live Air Traffic Control | You Want to Get There Safely, Don't You? Find more about weather and aviation. What do we need live air traffic control for? Haven't you in your childhood days looked up in to the air, fascinated with the flight of an aero plane? Have you ever thought it would be nice to have all airplanes operate without any incidents? Let us find out something about how aircrafts are guided in the air by live air traffic controllers. According to some estimates, every day there are as many as 50,000 airplanes in the skies of United States alone. You may wonder how they can travel without colliding – the answer comes from live air traffic control. It coordinates the movements of many hundreds of aircraft simultaneously and gives vital instructions to keep these vehicles at safe distances from one another. Live air traffic control also ensures smooth takeoffs and landings and the service directs pilots through bad weather, all the while minimizing delays. Is it that simple? No. The personnel responsible for air traffic control undergo a process of careful selection and rigorous training in order to keep their cool in highly stressful conditions. They also use a wide variety of equipment and wireless communication devices to track, and ultimately direct, the movement of planes. Commercial, private and military aircrafts all need the services of air traffic control, because their requirements are all pretty much the same. An air traffic control game, a simulation of air traffic control, can give a glimpse into the pressure every air traffic control person endures. While you play the game of air traffic control, you may experience the kind of stress involved in guiding multiple planes safely. This is part of the purpose of the game. Flight Service Stations (FSS) giving information about weather and air route to private planes. Now check out the jobs on the right. 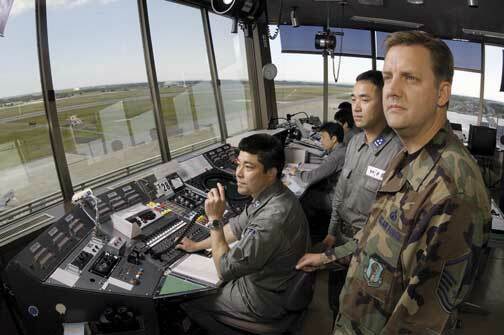 A plane may be monitored by more than one air traffic controller. As the aircraft leaves one air traffic division and enters other, the control and the required information is seamlessly passed to the next controller. However the biggest challenge to air traffic control is the increasing number of aircraft and insufficient number of runways and air traffic routes. NASA and FAA have been working on developing a series of software solution and training programs to ensure safe and speedy air traffic. However this will not reduce the demand for human air traffic controllers in the traffic control towers. Look into this career possibility. Or the ones listed on the Environmental Health & Safety Jobs page.